JOHN DEERE EXACTEMERGE™ PLANTER Active pneumatic downforce active pneumatic downforce makes getting the planting accuracy desired even easier. A hydraulically driven compressor works with the SeedStar™ 3 HP system and SeedStar XP system to automate downforce control. Just set the row-unit target margin value and the active pneumatic downforce system works automatically to make sure the planter maintains this value-achieving precise soil penetration, and consistent planting depth, without sidewall soil compaction. This frees the operator from constantly making manual downforce adjustments as conditions change. It also allows the operator to focus on all the other planting factors that drive up yields, like seed singulation and spacing. This system also offers a split rank control feature for 1795 and DB Split-Row Planters. On top of actively controlling the pneumatic downforce system across the planter, John Deere active downforce will control the front and rear rows of split-row planter independently. This compensates for differing downforce requirements between the ranks that can be caused from things like different tillage or insecticide attachments and will help maintain an accurate planting depth and consistent margin across all the rows. 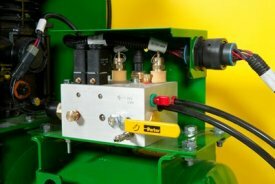 Active pneumatic downforce is available as factory installed or as an attachment for field conversion. Pneumatic downforce systems are available as base equipment on all 1705 Series and DB Planters. 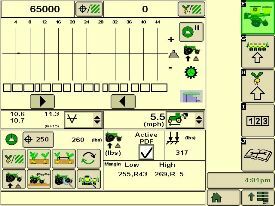 Active downforce control is integrated into the SeedStar XP monitoring system. Only small changes can be noticed on the display, but these small changes can simplify operation by automating control. Once a target margin has been defined, enter the value into JOHN DEERE EXACTEMERGE™ PLANTER Active pneumatic downforce SeedStar XP and let active downforce do the rest. 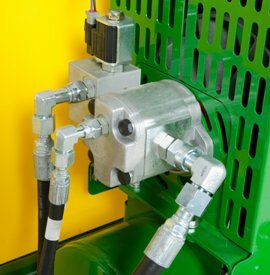 The system will actively adjust the air pressure in the air bags to maintain a constant margin across the planter. The changes in air pressure will change the amount of downforce placed on the row unit compensating and reacting for varying conditions through the field whether it is different tillage practices, soil types, or moisture. 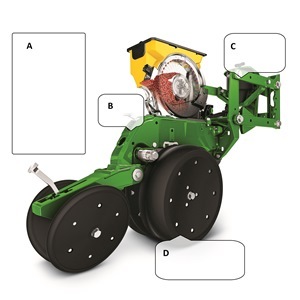 A) Margin – Amount of additional down force applied to a row unit above and beyond what is required for penetration to achieve planting depth. This additional weight will ride on the depth gauge wheels. At approximately 4 gpm, hydraulic demands are low and ties into the machine’s lift and Central Commodity System (CCS™) hydraulic circuit so it does not require any additional selective control valves (SCVs). 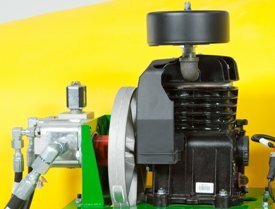 The SeedStar XP monitor works with the compressor and valve assembly to regulate air to downforce springs enabling the active control. 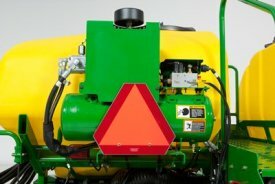 Another feature of JOHN DEERE EXACTEMERGE™ PLANTER Active pneumatic downforceactive downforce is the ability for the pneumatic valve to independently control split rank machines. This system senses the downforce needs from the front and rear ranks separately and independently adjust air pressures with the dual rank pneumatic valve when equipped. 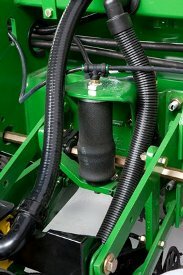 JOHN DEERE EXACTEMERGE™ PLANTER Active pneumatic downforce active pneumatic downforce requires SeedStar XP to enable active control. Each row unit has one rubber air bag located between the parallel arms. The air bags are hooked in series so that air can be added or released from all rows at once from one location.